An American Taxi driver left the road at Windsor Drive, just north of Suffield Drive and hit a tree. 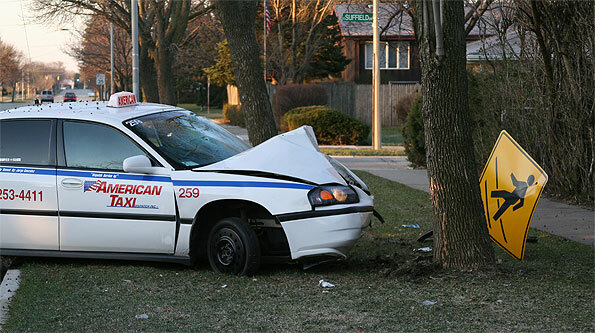 Arlington Heights police received a report of a taxi that hit a tree in the parkway of Windsor Drive near Suffield Drive about 6:20 a.m. Easter Sunday. 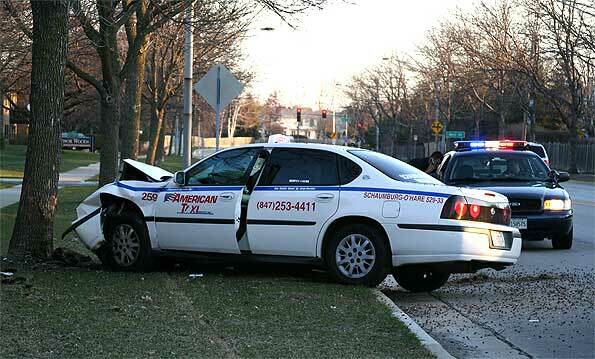 Arlington Heights Fire Department paramedics responded, but the driver said he was not injured. The taxi had extensive front-end damage, and also damaged a school children crosswalk warning sign, which apparently damaged the windshield of the cab. The driver may have fallen asleep and lost control of the cab when it crashed into the sign and the tree. A taxi crash into a tree resulted in no injuries, but caused a tree to drop debris on Windsor Drive. Windshield damage to taxi apparently caused by a child school crossing warning sign. Neighbors and joggers were happy no people were injured in the accident. The car had a front right spare tire installed and that observation had people wondering if the driver had a long night with a flat tire.